It’s January. The snow is swirling, the wind is howling, and the frost is creeping up the windowpanes. And that means it’s time to trundle out the trusty slow-cooker for a big batch of no-fuss comfort food. In this case, that means dressing up ordinary chicken breasts with a decadent combination of fatty bacon and smoky-sweet apples in BBQ sauce, and then setting everything to cook into the slow-cooker until all the flavors combine and sink deep into the meat. Like most slow-cooker recipes, this one is quite simple especially if you already have a batch of BBQ sauce ready. The amount of bacon you need will vary depending on the size of your chicken breasts (most take two, but some of the bigger ones need three), but other than that whole affair is as straightforward as you could ask for. The slow-cooker makes everything very convenient, but if you want your dinner done faster, you can also pour everything into a baking dish instead and cook it in the oven at 200-300 F until the breasts are done (160 degrees in the center) and the bacon is crispy. Serve hot with a big scoop of apple-BBQ sauce on top, and enjoy the perfect cure for a cold and dreary evening. SERVES: 4 PREP: 15 min. COOK: 6-8 hrs. 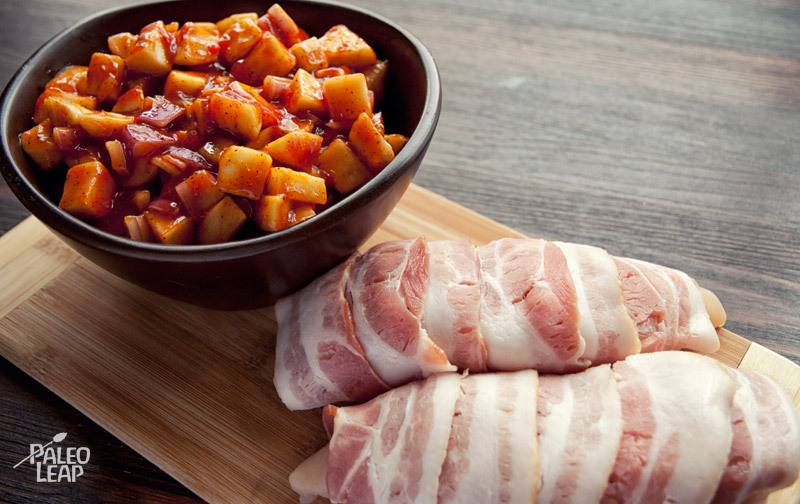 Wrap each chicken breast with bacon slices. 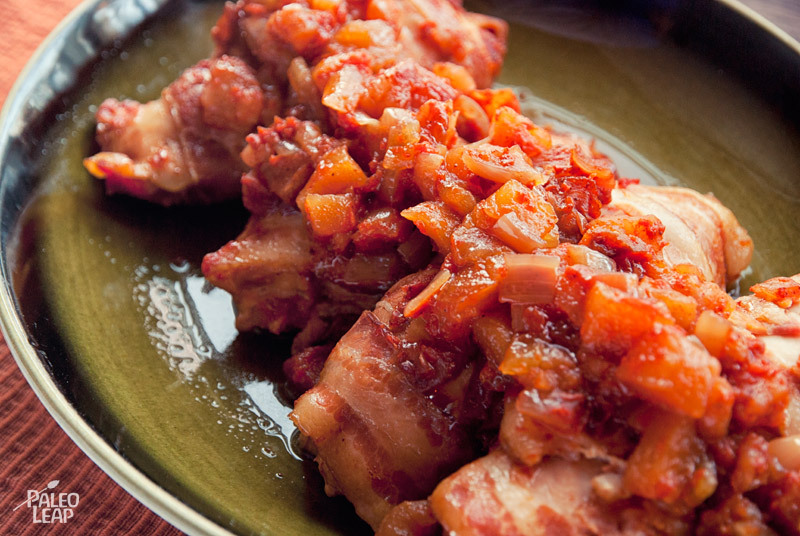 Place each bacon-wrapped chicken breast in your slow cooker. In a bowl, combine the BBQ sauce, lemon juice, apples, and onion, and mix well. Pour the BBQ sauce mixture over the chicken. Cover and cook on low for 6 to 8 hours. Serve the chicken breasts topped with the apple and onion mixture.